Okay, guys… it’s time to get serious. Like food serious. I’ve been on this cruise for 6 days now and no doubt those late night buffets are callin’ my name. I’m fighting the urges (and winning!) and battling back harder with early morning trips to the fitness center (gotta get my sweat on before I even attempt to lay outside in a bathing suit.) It’s great that I have a boyfriend who loves to work out as much as I do because I don’t have to beg him to go with me. I’m coming home tomorrow with full details (and pictures) about everything I ate (and hopefully passed up on the buffet line) while I was on my cruise and start cooking lots more (super healthy!!) food when I get back. On that note, our last guest post is from Megan, host of Cooking Whims. Megan and I went to college together and she lived with one of my best friends so we got to know each other pretty well. And we might have been in a musical together where I played Snow White and she was a sacred cow… NBD. Anyway, if you love to cook as much as I do, you need to check out her blog. Not only is her food delicious but she is also an aspiring photographer… and quite talented. First of all, thank you Marie for letting me guest post today! I love reading Marie’s blog and am honored to be writing up a post for her today. Today I’m going to feature a pasta dish–and this isn’t your traditional spaghetti and meatballs. 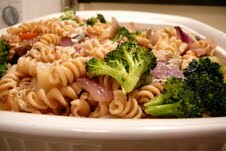 This is a meatless, yet hearty pasta dish with incredibly flavorful roasted veggies. 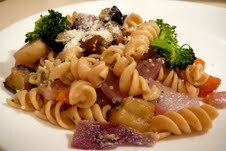 The vegetables consist of button mushrooms, eggplant, potatoes, carrots, red onions, and broccoli. They are roasted in a coating of olive oil, garlic, rosemary, and thyme. Now, I’ll all for trying new and exotic things and stepping it up in the kitchen to an extra daring level, but most days after work all I want to do is get in my workout, eat dinner, and park myself in front of the TV for the rest of the night. So I love having easy, healthy, and delicious recipes on hand to make this thought a reality. Let’s save the sautéed octopus for the weekends, shall we? 1. Preheat oven to 400 degrees F. Combine first 8 ingredients in large roasting pan. Add olive oil and toss to coat well. Sprinkle with salt and pepper. Roast until vegetables are tender and beginning to brown, stirring occasionally, about 45 minutes. Then add broccoli to pan and roast until the broccoli is crisp-tender, about 10 minutes. 2. Meanwhile, cook the pasta according to the package directions. Add ½ cup of pasta water to vegetables in roasting pan. Toss pasta with veggies to combine. Sprinkle with Parmesan cheese. My Two Cents: This dish is so versatile. You can throw your favorite vegetables into the roasting pan, or even do a “clean-out-the-fridge” meal with this pasta dish. Half a tomato in the fridge? A quarter of a zucchini? Throw ‘em in there! It’s a great way to use leftovers. Overall, perfect meal for a casual weeknight.